Dice Devils GC: War of The Machines! Warmachine is sweeping through the Dice Devils crew like wild fire! 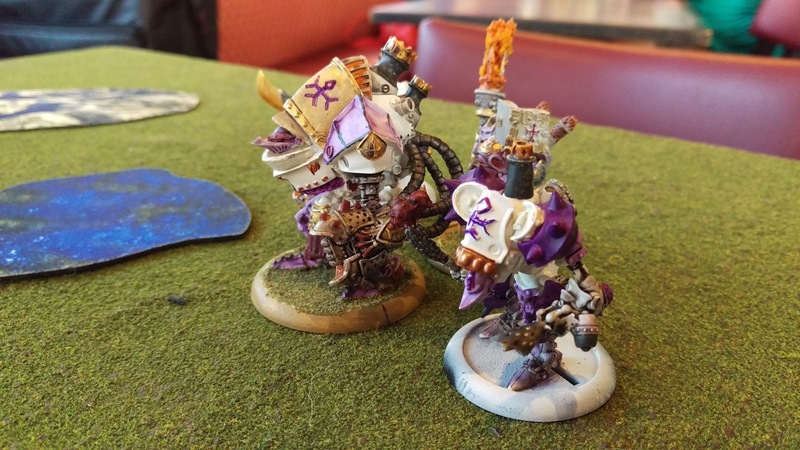 Most of us are either buying a complete Battlebox army, or using existing models that we have. 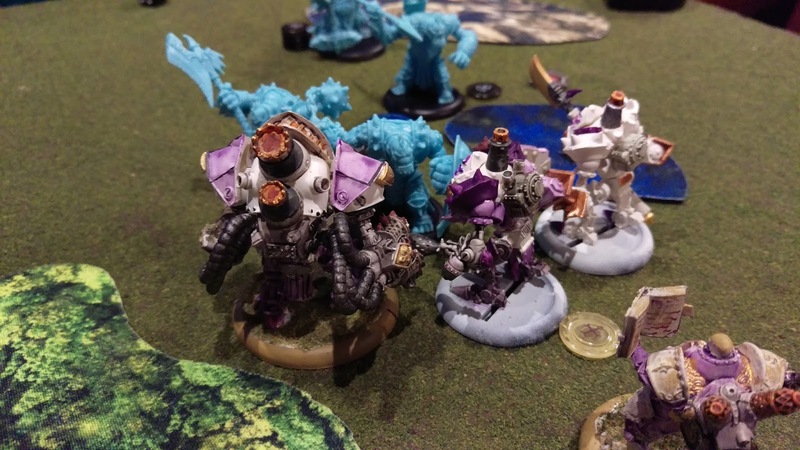 Warmachine is essentially a skirmish based miniatures game that is both easy to learn and fun to play. Adding in the fact that the games do not take a long time to complete, you can play multiple games in an evening. We've also found several new places to buy and play this game with new players getting into it! 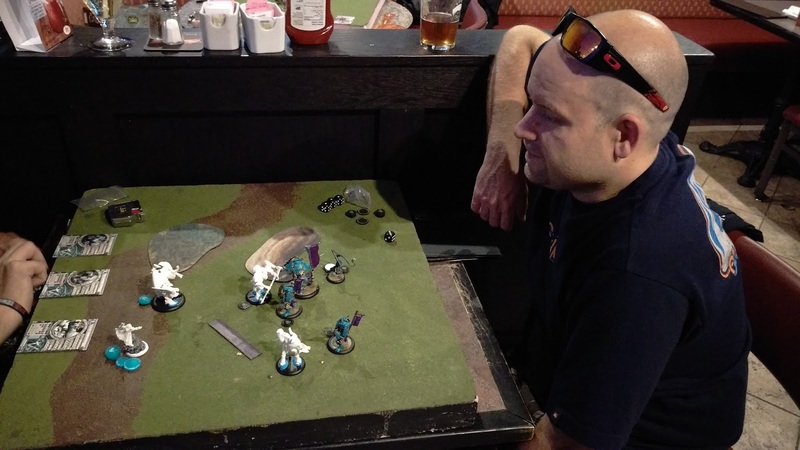 Cash contemplates his next move at the Monday night gathering at The Barley Mow, nothing much beats pints and wargaming. He was lucky enough to play two games that night, while I had only time to play one match-up. I decided to pick up The Protectorate of Menoth for my Warmachine faction. 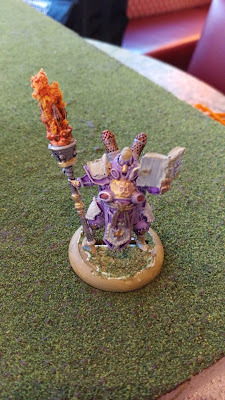 Seeing as they are a 'holy' faction, I decided to do them in a religious purple and gold. This faction has a large amount of white and since that is a little bland, some color is necessary to liven up these models a bit. 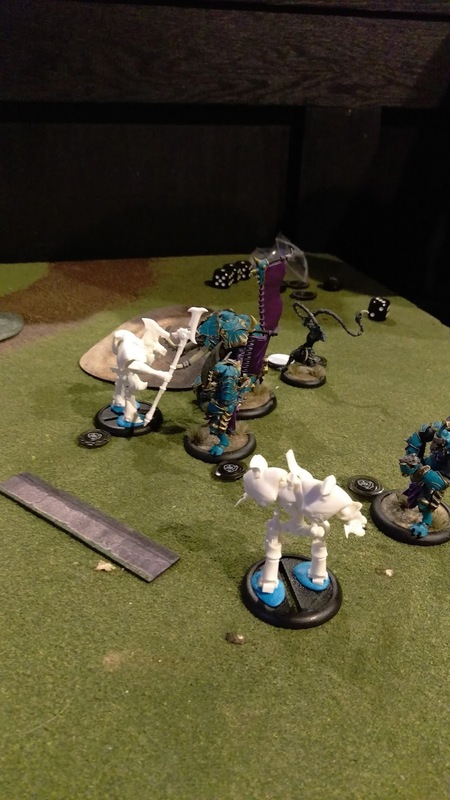 The Battlebox is a great idea, you get a fully capable army, rulebook, dice and tokens, a paper measuring tape, a small play mat and of course your models. Most boxes consist of 3-4 models, they also have a smaller book inside that contains lore on your faction. Inside the second book, you'll find painting and playing tips for your new army. A great idea for a new player to any game, and at $40 CDN for the Battlebox, it's easy on your wallet. My entire army, consisting of my Caster in the foreground with the book in his hands, my Heavy Warjack on the left and is flanked by my two Light Warjacks. 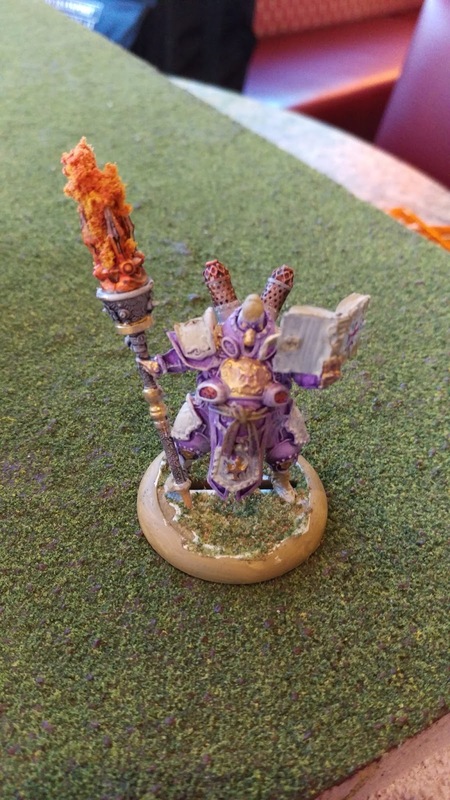 Doesn't look very menacing while he's reading, but my Warcaster has some powerful and very effective spells to help the cause! Here I am taking on Marty and his Trollbloods, a factions from 'Hordes' the more fantasy based side of the Warmachine/Hordes game systems. It's pretty neat you can play a list from either and the game is balanced and essentially the same to learn. A closer look at Tristan's awesome models, the teal color of the armor plating and darkness of the skin tones is a great scheme and looks great on the table. I know he is contemplating changing or maybe darkening the scheme a bit, but I am trying to convince him to leave it, as it is quite different from anything else I have seen on the table thus far. Obviously they pop against his opponents unpainted army on the table in this game. I learned a lot in this matchup about missing with a spell. Essentially I tried to target my opponent with a 'Knockdown' spell, attempting to knock over a Heavy Warjack that was tearing up my lights, and making a threat against my Warcaster. 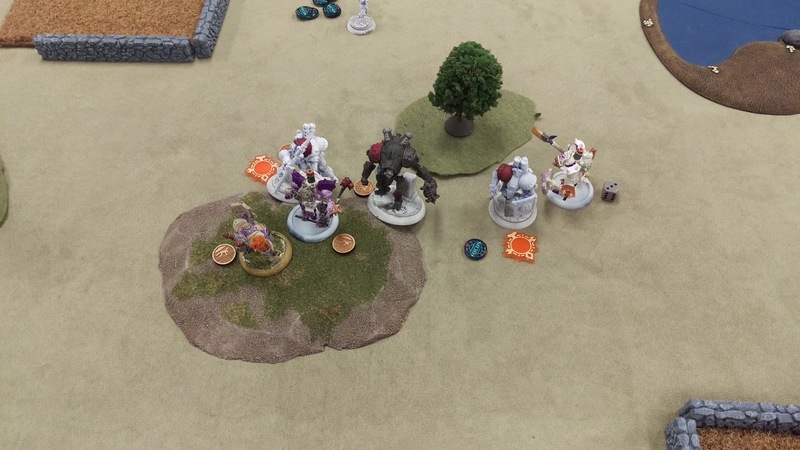 Short version is I missed my target, the spell came back at me and centered between four models, knocking them all over and pretty much guaranteeing me getting stomped on my opponents next turn. Without being able to get up, once you are down on the ground your enemy can close distance and basically smash you easily. Models do not have to roll to hit you when you are lying there on the ground. Lesson learned. The new store on our gaming radar is Out of The Box. It's a great little store here in Ottawa that carries all sorts of board games, miniatures and sports cards. With a larger selection and better prices than many gaming stores I have been in, you should check it out for your gaming needs. If they don't have it, the staff there is super about getting stuff in for you, sometime it only takes 1-2 days for most gaming items to arrive, which is better than ordering online or driving around to other store to see if they have what you're looking for. The crew will be supporting this store further by going there to play games and help them grow their business when it comes to gaming. Hopefully even host events there in the future, as they already have plans to expand and increase what is an already capable gaming area. For more info, please visit the link below. Out Of The Box Sports Cards & Collectibles Inc.